"One reader's literature is another reader's garbage can liner... whether it is literature or not is something that will be decided by the ages, not by me and not by a pack of critics around the globe." Arthur W. Upfield was an Englishman transplanted to Australia and exploring the outback as a Jack-of-all-trades provided him with an opportunity to accumulate a vast wealth of knowledge, experience and understanding about his adopted homeland – which served him well when he finally settled down behind a typewriter. However, the aim of his literary ambitions reached far beyond a volume of reflections on his Australian experiences. Upfield was far above mere literature and pursued one of the noblest ambitions of man: to craft and forge great, imperishable detective stories that'll be with us long after their creators became dust. This was a task that lasted for several decades, from the late 1920s to the early 1960s, which saw the publications of twenty-nine novels about Detective-Inspector Napoleon "Bony" Bonaparte of the Queensland Police. The Barrekee Mystery (1929) introduced and added a detective to the genre who was truly unique in every single aspect of his character. Bony is of mixed race, a "half-caste," who drew on both his white and aborigine heritage to ascend the ranks of the police force. A tracker and hunter in a suit who can stake out a desolate location for weeks, track across endless, sun-blasted planes and dust choked flatlands or hunt down anyone who sought refuge from the law in the dense bushes of the Australian outback – giving this series a distinct and unique character of its own. But, sometimes, Upfield confronted his creation with, what could be labeled, as a domesticated murder case. An Author Bites the Dust (1948) is the 11th entry in the series and takes place in the fictitious town of Yarrabo, situated in the valley of the real Yarra River, where two of the ringleaders of the Australian literati have settled down. Mervyn Blake is a novelist, critic and president of the Australian Society of Creative Writers, but, above everything else, he's a snob with a bloated opinion about the importance of his own contribution to the field of Australian literature. His wife, Janet, only published several short stories and some verses, but she is right beside her husband as they organize weekend parties for a small coterie of back-slapping authors/critics – who go through great pains to differentiate "between literature and commercial fiction." As to be expected, they fancied themselves to be the pedestal the first column was erected on, but the Australian public response was, "if this was literature," they "would have nothing to do with it." Hear, hear! You'll get a glimpse of the nature of these people when the reader is allowed, briefly, to be a silent observer at one of their gathering. There's a haughty response to detective-and commercial fiction when, while "discussing the novel and novelists," someone accidentally mentioned "the atrocious efforts of a 'whodunit' writer," because their sole interest is Australian literature and the influence their small clique "may exert upon its development." It is also stated "there was never yet a best-seller that had any claims to being good literature" and with literature they meant the kind that is "understood by the cultured." Thankfully, the end of that particular chapter reports to the reader the unexpected and inexplicable passing of Mervyn Blake. Blake is found on the floor of his writing room, clawing the closed door, but the local authorities are unable to determine how he had died and the result is an open verdict, which leads the case to grow cold over the stretch of several months. Until, that is, Superintendent Bolt puts Bony on the case, because he did not want the case to become stone cold and believed the peculiar circumstances would interest him – which it did. So Bony becomes a paid lodger of the next-door neighbor of the Blakes, Miss Pinkney, who shares her home with the memories of her dearly departed brother and an enormous all-black cat. The animal listens to the name Mr. Pickwick and is fond of playing with an old, gnawed ping-pong ball, which will eventually provide Bony with an important clue that puts him on the path towards the solution. In spite of the months that have passed and the scattered group of suspects, An Author Bites the Dust can still be classified as a traditional mystery with a closed-circle of suspects. Considering the characteristics and profession of the victim, as well as that of his potential murderers, I got the impression Upfield purposely lifted Bony from his preferred surroundings in order to explore a traditionally plotted murder in a domestic surrounding – because he reportedly really hated those kind of critics and some of them were apparently modeled on real-life examples. The story also impressed me as an unabashed homage to his fellow mystery writers and everyone who attempted to write exciting stories. Upfield mentioned Joseph Conrad, John Buchan and S.S. van Dine, but there's also a character in the book, a mystery writer by the name of Clarence B. Bagshott, who impressed me as the Ariadne Oliver to Upfield's Agatha Christie. Now that I’ve mentioned Christie, the story and plot seems like a conscious imitation of one of the British Crime Queen: there's a very bizarre, but original, poison used that you would expect to find an Edgar Allan Poe story, but a Van Dinean footnote assured the reader the substance was not an unknown poison as it was authenticated by Prof. Alfred Swaine Taylor – which can be looked up in a dusty old book titled The Principles and Practices of Medical Jurisprudence (1873). There's the depiction of Miss Pinkney, which is one of the kindest and warmest I have seen of a spinster in mystery fiction, but also the type of character you'd expect to find in Crime Queen novel. But the most attractive aspect of the book is Upfield giving a well-crafted finger to the no fun having literary crowd who look down their nose at, what they call in Australia, commercial fiction. So, An Author Bites the Dust was a bit different from the books that initially lured me to the series, such as Death of a Lake (1954), Cake in the Hate Box (1954) and Man of Two Tribes (1956), but, as is obvious from this review, I enjoyed this little sidetrack in the series. And I think it's safe to say that I share some opinions with Upfield on what's good fiction. Even though I still haven't read Buchan's The Thirty-Nine Steps (1915), which I have remedy one of these days. 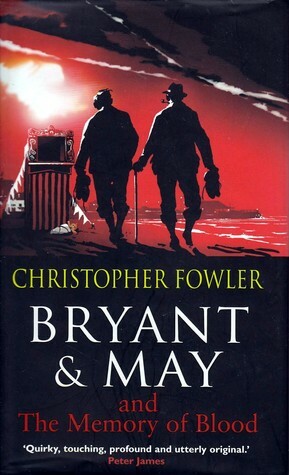 "Why, you little blockhead, I'll whittle you down to a coat hanger..."
Thirteen years ago, Christopher Fowler's Full Dark House (2003) was published and introduced what, arguably, are the first Great Detective of the 21st century: two nonagenarian detectives, named Arthur Bryant and John May, who have been leading a contingent of special investigators since the 1940s – known as the Peculiar Crimes Unit. Peculiar Crimes Unit was founded "soon after the outbreak of the Second World War" as "part of the government initiative to ease the burden on London’s overstretched Metropolitan Police Force." Staff members have always comprised of outsiders and radical freethinkers who were, initially, tasked with handling investigations "deemed uniquely sensitive" and "a high risk to public morale." But over the decades, not everyone understood that peculiar was originally meant in the sense of particular. Consequently, the unit found themselves in charge of a large number of extraordinary, bizarre and seemingly impossible crimes – which even included several locked room murders. So it's not surprising the series was part of the first wave of contemporary mysteries that slowly convinced me that, perhaps, not everything written after the Golden Age was complete tripe. I discovered the Peculiar Crimes Unit series in 2007 and was an unapologetic, fundamental classicist in those days, but, despite my rabid hatred for modern, character-orientated and socially concerned crime novels, I plunged headfirst into Full Dark House, The Water Room (2004), Seventy-Seven Clocks (2005) and Ten Second Staircase (2006). They challenged my preconceived notion of the genre and genuinely loved the journey, but, sadly, my interest began to wane after White Corridor (2007). The books morphed from wildly imaginative, neo-Victorian crime novels into regular police procedurals with some weird elements. After reading Off the Rails (2010), I decided to take a break from the series, which continued until this very blog-post, but only a year after dropping out I began to read how The Memory of Blood (2011) had reinvigorated the series by cutting back on the social commentary and refocused on the plot – going back to what the series originally was. And it only took me about five years to verify this for myself. The Memory of Blood is the ninth entry in the series and, just like the first book, has a theatrical setting. So it really is a rebirth, of sorts, for the PCU. Robert "Julius" Kramer is a self-made man who became a millionaire before his twenty-fifth birthday, which he celebrated by "informing his loyal girlfriend that he was now rich" and "dumping her." Kramer is not a pleasant person, but that’s to be expected from someone whose role model is Mr. Punch. It allows him to be as "pugnacious, amoral, murderously strong-willed" as he wants in order to "rise above mere morality" and he bought the New Strand Theatre to indulge in his theatrical hobby. He even slapped his own theater company together. The first of his lurid, trashy and sensational plays, The Two Murderers, is about to open and to celebrate the occasion Kramer is hosting a party at his London penthouse, but there's a bad and tense atmosphere – amplified by the gloomy weather outside. You would expect this to be the moment a steak knife is plunged in Kramer's back, but the murderer among them has struck somewhere else in the house. Kramer's second, much younger wife, Judith, finds the door to the upstairs room of their infant son, Noah, locked from the inside and the door has to be broken down. What they found is unsettling: a window that was supposed to be locked was wide open and an antique, grotesque-looking puppet of Mr. Punch was lying in the middle of the room. The small body of Noah was found beneath the window and a post-mortem examination reveals he was violently shaken, strangled and flung out of the window, but what's really remarkable is that Mr. Punch's hands "exactly fit the bruises on Noah Kramer's neck" – suggesting that the Victorian-era puppet had come to life to fulfill "his mythical destiny to become a murderer." All of that happened inside a locked nursery with an open window affording no escape to a murderer. It's a dark, grisly and gruesome murder, but finding the person who's responsible turns out to be very similar to "playing some elaborate version of Cluedo" and they’ve some work to do before they can identify their "Colonel Mustard in the sodding library with the lead pipe." There's no shortage of potential suspects: there's the leading man, Marcus Sigler, who has been having an affair with Judith and sneaked out of the party with the new assistant stage manager, Gail Strong, which gave Robert Kramer a strong motive as well. Ray Pryce is the "archetypical angry playwright" and part of the anger comes from the greediness of the producer, Gregory Baine, who has stopped salaries and put everyone on a profit-share. Something that can be manipulated by fiddling with the books and therefore Kramer and Baine would've to payout less to the cast and crew. One of them is a brilliant set-designer, Ella Maltby, who's responsible for bringing a wax dummy to life during the first act of the play and that's an interesting talent when you're dealing with an apparent homicidal puppet, but these are only a handful of people who were present at the party and could've fulfilled the role of killer – since everyone in close proximity to Kramer seems to have had a reason to harm or hurt him. The investigation takes place while the PCU is settling into their new office building, which was once the dwelling of the infamous Aleister Crowley, but their situation seems to get gradually a bit better. Bryant found a new member to the team hidden in the attic: a dusty, cobweb-covered automaton of a fortune-teller that spits out cards with vague, cautiously worded predictions on them. Of course, Bryant has a pocketful of old coins to feed to automaton. Even Raymond Land, who has been the temporary acting head of the PCU for many years, seems to finally come to peace with his fate of being stuck there. However, there are some things that never change: the ever-subversive Oskar Kasavian is still attempting to get the PCU shutdown and a new, ongoing sub-plot appears to have been set-up in the background, which happens when the editor of Bryant's memoirs succumbs to bacteria poisoning and something rather important is missing – a disc containing information of a number of important cases from the unit's past. The Leicester Square Vampire, who killed John May's daughter, and the storyline about Mr. Fox from the previous two books, covered such previous plot-strands that ran through several books. I have no idea which direction this storyline will take, but, as of now, it seems interesting. But all of that takes place in the background. 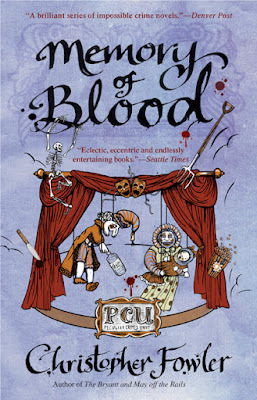 The Memory of Blood is a very plot-oriented detective story, but one with sharp characterization and a great theatrical background that's steeped in puppet lore and London's unique history. That has always been a major asset to the PCU series: Fowler's deep-rooted love for London's history. I don't remember any of the other books to be as sound in plot as this one. The clueing is a bit clunky here and there, they were too obvious or given too late, but they were present and Fowler provided answers as to why (and how) the handprints of a puppet were on the throat of a dead baby. Or how the murderer was able to improvise a locked room trick on the spot. It's a simple method that's derived from an old trick, but I rather liked it when place in the overall plot of the book. So, all in all, to cut this overlong, drawling review short, I would mark The Memory of Blood as my favorite entry in the PCU series and the only downside is that I waited so long to return to Arthur Bryant and John May. "Elephants can remember... that was the idea I started on. And people can remember things that happened a long time ago just like elephants can. Not all people, of course, but they can usually remember something." During the final quarter of 2015, the already indispensable Dean Street Press reissued half of Annie Haynes' neglected, long-forgotten and out-of-print body of work, which consisted of seven mystery novels starring either Inspector Stoddart or Inspector Furnival – all of them furnished with an insightful introduction by our very own genre historian, Curt Evans. Now they are going to complete their reissues of Annie Haynes' crime-fiction with the scheduled release of all five of her standalone novels. 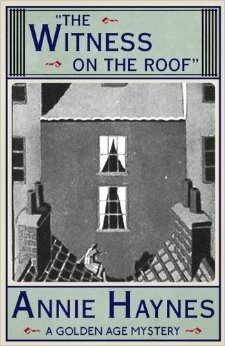 Rupert Heath of the Dean Street Press offered a review copy and I requested The Witness on the Roof (1925), because I was fascinated by the book’s plot description. The Witness on the Roof begins in early May, 1897, in Grove Street, "a precinct which had undoubtedly known better days," where the only "remnants of past greatness" are the lofty rooms and large windows. A young, impish child, called "Polly," has taken refuge between the chimneystacks on the rooftop to escape from the rough blows and verbal abuse leveled at her by her stepmother. At first, Polly is looking upon this rooftop world like "a conqueror exploring some unknown world," but she began to wonder what happened behind all those blinds and peeked into a window of a studio apartment – where she saw something that would come back to haunt her as an adult. Polly observes a room stacked with unfinished canvases, an untidy litter of paint tubes and a big easel in the middle of the room, but what really attracts the child's attention is what looks like "a heap of white drapery" near the fireplace. There's also a man present in the room. A tall, broad shouldered man who's busy tearing up papers, photographs and books, which were then tossed into the bright, open fire that roared on the hearth. As Polly witnesses this strange scene, she slowly comes to the realization that the "tangled mess of drapery heaped upon the rug" is the body of a young woman! She sees how the man places a gun near the dead woman's hand and gives herself away. However, the only thing the man sees is a child "scuttling over the roofs" until she's out of his sight. There would be many years before anyone else learns that there was a witness to, what the newspapers called, the Grove Street Mystery. well-born family of her late mother. A decade came and went and the passing of the years turned the "small, grimy-looking child" with "ragged brown hair" into a proper lady. Living with her cold, uncaring grandmother was not a full improvement on her previous situation, but, recently, the world started looking favorably upon Polly – who's now known to everyone as Joan Davenant. Her grandmother's will named her beloved, long-lost sister, Evie, as the main beneficiary, which means people were finally going to look for her. On top of that, Joan has married a wealthy, titled gentleman and became Lady Warchester. Everything appeared to have worked out for her in the end, but when she takes an innocent stroll down a garden path, snaking around her home, she sees something that awakened memories that have lain dormant for a decade. She glanced at one of the windows of her home and sees someone moving around that room that suddenly reminded her very much of the man she saw on the roof in Grove Street as a child. It’s someone very close to her! I've already seen The Witness on the Roof being compared with Agatha Christie's Sleeping Murder (1976), which was originally penned during World War II, but it should be pointed out that the plot also has certain points of resemblance with 4:50 from Paddington (1957). The Witness on the Roof shares a child witness and a crime in the past with Sleeping Murder, but the window scenes described above were very reminiscent of how Mrs. McGillicuddy saw a murder being committed and identified the murderer by the end of 4:50 from Paddington. You can see Haynes' story as a combination of these two plots. Stylistically, The Witness on the Roof seemed like Baroness Orczy expended one of her short stories into a full-length novel, because "The Grove Street Mystery" could easily have been the title of one of the stories from The Old Man in the Corner (1909). The plot also followed the pattern of the type of crime-fiction that was writing during the time the story was set in, i.e. the late-1800s and early 1900s. There were a number of characters acting as detective, searching for answers to such pertinent questions as the identity of the murdered woman, while other answers were supplied by characters confessing to their part in the drama or showing their true colors. It makes for a nice, extremely old-fashioned detective story that's only marred by the cosmic coincidence that connected certain characters so long after the murder in Grove Street. You can argue it's the kind of singular coincidence that streaked sensationalist fiction from the Victorian-era and showed Haynes belonged to an earlier period in the genre's history, but if you love both crime-fiction from the days of Conan Doyle and Fergus Hume than you might want to give The Witness on the Roof a look. I feel as if I have not done the book complete justice with this lousy review (distractions, distractions), but I definitely enjoyed the book, because I was in the mood for something genuinely old-fashioned and Haynes filled that order with a well-written, very satisfying book reflecting an earlier period of the genre that preceded the Golden Age. Considering it was published in the mid-1920s, you can say it still counts as a transitional mystery novel, albeit a late one, but still a transitional one. I previously reviewed Who Killed Charmian Karslake? (1929) and The Crystal Beads Murder (1930) by Haynes. 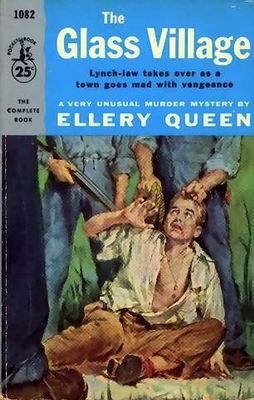 Frederic Dannay and Manfred B. Lee garnered their fame under a joint pseudonym, "Ellery Queen," which became a franchise that spawned radio plays, TV-series, movies, comic books, board games, jigsaw puzzles and the illustrious Ellery Queen's Mystery Magazine. All of that sprang from a bibliography as labyrinthine as one of their plots. After The Finishing Stroke (1958), Lee was plagued by writer's block and the tandem decided to summon a flurry of ghostwriters to flesh-out Dannay's skeletal manuscripts, which was kept under wraps at the time, but the list of writers who operated as Ellery Queen included some interesting names – such as Avram Davidson and Edward D. Hoch. You can easily confuse one ghostwriter for the other, but I wasted a good fifteen minutes searching (angrily) for the hired hand behind The Glass Village (1954). It turned out there was none! The Glass Village is a non-series novel and therefore I presumed, erroneously, it had to be ghostwritten, but I eventually stumbled to the fact that it was an Ellery Queen original. One of the few Dannay and Lee wrote without Ellery or Richard Queen. It's an unusual, character-driven courtroom drama/legal thriller set in a sparsely populated, dying backwater, called Shinn Corners, tucked away in the New England countryside. Shinn Corners lies in a valley, "looking like a cluster of boils on an old man’s neck," with stretches of "untidy land," the dried-up remains of what had "once been a prosperous river" and "the huddle of once white buildings" – giving a home to a dwindling community that has been "reduced to a total population of thirty-six." Over the past hundred years, the towns surrounding the valley had slowly lured away a lot of the working force of the tiny hamlet. The scattered "ruins of houses and barns and mills" and the remnants of a factory building are tangible reminders of a period when the village prospered, which now, in spite of its constant struggle for existence, keeps getting poorer every year. But at least it's a peaceful place. Judge Lewis Shinn explains to a visiting relative from New York, Johnny Shinn, a veteran of World War II and the Korean War, how the grim specter of murder has graced the village only three times in "two hundred and fifty some years" – which occurred between 1739 and fifteen years before the events described in the book. A local boy was killed in an act of self-defense by a hired farm hand from outside of the community, "a furriner," who was acquitted by a court in a neighboring town and that left the villagers feeling deprived of justice. It will have some far-reaching consequences when murder returns to Shinn Corners about a century ahead of schedule. Ninety-one year old Aunt Fanny, described as "a fabulous old lady," was born in Shinn Corners and became a minor celebrity in her eighties when she began to paint. She made "a fortune out of her Christmas cards, wallpaper and textile designs" and her paintings can fetch up to fifteen hundred dollars. A brief conversation she had with Johnny Shinn revealed her as one of the more kinder, understanding people of the village, but, of course, that was not to last – as someone obliterated her skull with a fire-poker in her paint room. The brutal murder of Aunt Fanny coincides with the arrival in the village of a Polish tramp, named Josef Kowalczyk, who had been admitted to the United States in 1947, but the villagers, naturally suspicious of outsiders, want swift justice against the foreign element they hold responsible for the death of one of their own. They have evidence backing them: a hundred and twenty-four dollars was missing from a cinnamon jar from Aunt Fanny's home and that amount was discovered "in a dirty knotted handkerchief tied to a rope slung around Kowalczyk's naked waist," which clinches it for the angry villagers. They refuse to hand over Kowalczyk to outside authorities, remembering what happened fifteen years previously, which lead to an armed standoff with a dozen state troopers. In order to prevent a blood bath, Judge Shinn convinces those outside authorities, including the governor, to stage a show trail in the village. It's a ruse "to allow tempers to cool down so the prisoner can be got safely away" and "tried in the regular way in a court of proper jurisdiction." The trial has to be purposely botched so it can be overturned at a later date. Judge Shinn describes himself as "an unmitigated scoundrel" where "defending constitutional democracy and due process is concerned," which is forgivable, but his personal motivation seems a bit snooty and self-aggrandizing – stating that “even in a democracy” people "can't always be trusted" and basically have to be protected from themselves by "individuals here and there." Individuals such as himself. The inhabitants of Shinn Corners are portrayed throughout the book as bone-headed bigots, but the judge is really no different, except that his bigotry appears respectable, by "critically" gazing inwards instead of focusing on outsiders. You've got to cut the people of Shinn Corner some slack, because here you have a small, dwindling and largely isolated community of hardworking, but very poor, people confronted with a stranger in possession of money that was stolen from one of their own who had just been murdered. It does not excuse the formation of a lynch mob, but I expected at least a small amount of understanding and sympathy for the villagers. There was, however, not a drop of that to be found. Anyhow, the trial takes up the second part of the book and this is the point where the detective-element of the plot finally begins to manifest itself, which had previously been wrapped up in character-introductions, a tour of the village, a man-hunt and snippets of social commentary about justice, communism, war and McCarthyism. Everyone's whereabouts at the time of the murder are subtly checked, the final painting of Aunt Fanny receives a closer examination and there's the all-important clue of the missing pile of chopped firewood. All of this reveals the real killer in time to prevent a second attempt at lynching the hapless tramp. 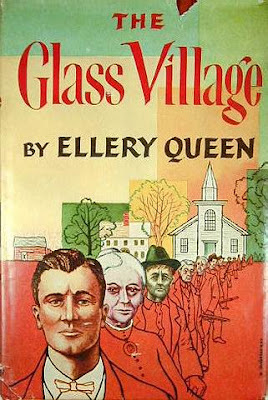 The heart of the plot, clues and alibi-trick might have been better suited for a short story or novella, but, on a whole, I found The Glass Village a fascinating read and surprised it was never adapted as a TV-movie or mini-series. It would lend itself perfect for that and today's audience would probably enjoy the morally ambiguous cast of characters. Anyway, it was a very interesting, unusual and surprisingly successful attempt on Ellery Queen's part at writing a more serious crime novel. Because they made similar attempts before and some of them were outright disastrous (e.g. Calamity Town, 1942). It's also the reason why I could not bring myself to title this blog-post The Polish Tramp Mystery. Well, I guess I did not entirely succeed in picking an orthodox mystery to review, but there's always next time. "I mean they were not even normal murders... the man who is hounding us all to death is a hell-hound, and his power is from hell." The Bath Mysteries (1936) is the seventh entry in E.R. 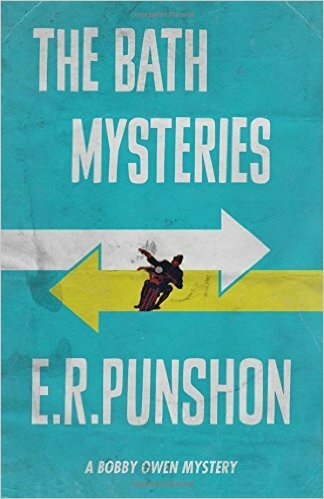 Punshon's Detective-Sergeant Bobby Owen series, which has an indefinable plot patterned after the infamous "Brides in the Bath Murders" from the 1910s and offered a brief glimpse at Owen's aristocratic side of the family – one of them who died under suspicious circumstances. Bobby Owen is summoned to the ancestral seat of his kin and the opening chapter finds him assessing the place's "interminable and depressing length," which has become unaffordable as a permanent residence, but the reason for his summons had nothing to do with the family coffers. It concerns one of his cousins, Ronald "Ronnie" Owen, who vanished over three years ago. The departure of Ronnie Owen coincided with a "disastrous and scandalous divorce case," after which "he had vanished from the ken of all his former friends and acquaintances," including Cora – his "justly offended wife." Owen seems to expect that Ronnie's drunken habit has finally caught up with him, but what is being revealed is far more serious and sinister than he could have possibly imagined. A woman who identified herself as the widow of man named Ronald Oliver, the presumed alias of Ronnie, pawned a signet ring that bore the family crest, which happened only a day after she collected 20,000 pounds from an insurance company. People had been murdered for far less in those days! There is, however, one problem: the body of the man, who called himself "Ronald Oliver," died in a bathtub from "the effects of boiling water coming from a lighted geyser" that "pour continuously for a day and a half." He was boiled alive! The police assumed the victim wanted a bath to sober up and was overcome by the steam, which led to a verdict of "Death by Misadventure," but his actual widow, Cora, disagrees with this interpretation – believing he was murdered. So the family draws on their influence to put Bobby in charge of a discreet investigation. It's not an easy or grateful task, because Bobby is fully aware that in an investigation "a time-lag of a few minutes is often of such importance as to make the difference between success and failure" and here there was an interval of months. And for "guilt there is no cloak like the lapse of time." However, that's not the only problem staring Bobby in the face: Ronnie had shuttered himself away in a small flat, cut off from his former life, which barely left anyone to interrogate. A problem amplified when Bobby comes across several potential victims, lonely men "who had fallen or been thrown from their places in society" and "deliberately cut themselves entirely adrift," but, somehow, still had their lives insured for several thousands of pounds – which in those days amounted to a small fortune. It's not surprising Bobby begins to suspect he's up against "a kind of murder factory," but it's also where the book begins to diverge from your typical, 1930s Golden Age-style detective novel. The plot of The Bath Mysteries is hard to define, because it consists of a lot of different elements: deceptively starting as a classic whodunit, but soon becoming more thriller-like with a conspiratorial nature that gives the story a sinister and unsettling touch. But underneath all of that, The Bath Mysteries is an early predecessor of the British police procedural. Instead of fretting about muddy footprints, cigarette buds and alibis, Bobby is pounding pavement and doing what looks like legitimate police-work, which can be experienced (when contrasted with the other elements) as dull and disappointing – because it's essentially routine police-work. There are also several characters who would feel quite at home in a modern-style crime novel by the likes of P.D. James or Reginald Hill: a woman trying to leave her life as a prostitute behind her, an ex-convict who mentally has never healed from a flogging he received in prison and an elderly, stick-fingered lady as old as she's experienced in evil. The book ends with these three characters as they find some redemption, which was a nice touch, but you have to read the book yourself to find out how. Punshon really strayed away from the Golden Age here, but, from a historical perspective, it's an interesting predictive book that anticipated the crime novels and police procedurals of the post-World War II era. He did so in the mid-1930s! The only weakness is that he also anticipated that murderers would not be as well-hidden as they were during his days, which is a pity, but the upside is that the book can be used as lure to draw readers of contemporary crime stories to our side. Speaking of historical content, The Bath Mysteries has one of the earliest references to the early days of television: Bobby is given a tour of a luxurious apartment and was "shown the television screen," but, "unfortunately," there was "no television programme on at the moment." You can watch a snippet of television from the year this book was published here. But I have prattled on long enough. I'll be back before long with a review of something slightly more orthodox. At least, I hope so. That was basically the plan when I picked up The Bath Mysteries to read. "Time takes it all, whether you want it to or not. Time takes it all, bears it away, and in the end there is only darkness. Sometimes we find others in that darkness, and sometimes we lose them there again." In my previous blog-post, I reviewed The Green Ace (1950) by Stuart Palmer. The plot of the book focused on proving the innocence of an inmate of the death-house, a week before his scheduled execution, which heavily influenced my decision on what to read next – namely Headed for a Hearse (1935) by Jonathan Latimer. 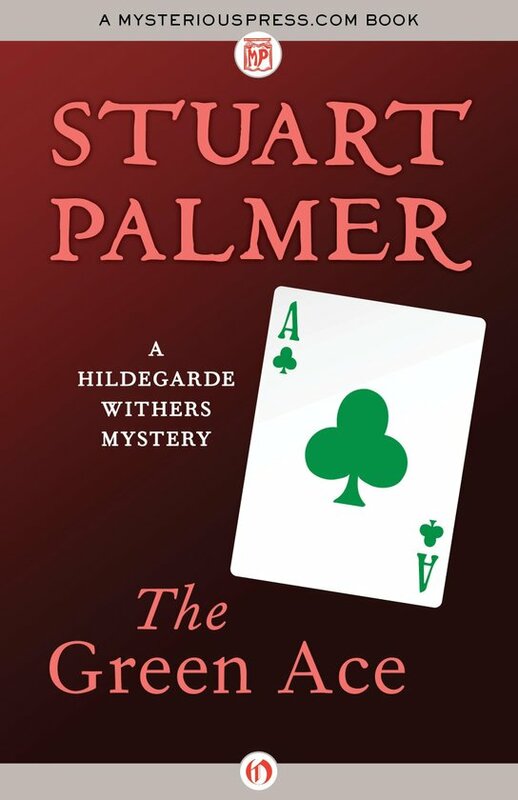 It offers a much darker treatment of the race-against-time plot device that Palmer toyed with in The Green Ace. 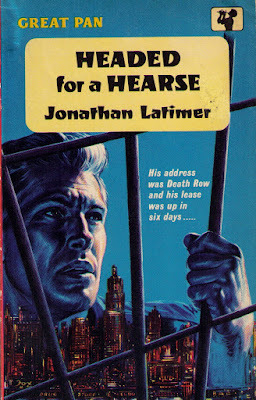 Headed for a Hearse, also published as The Westland Case, opens in "the dim cavern" of Robert Westland's condemned cell in the death-house – where he awaits his execution for the murder of his wife. A reviewer on the GADWiki observed that the book actually consists of two separate stories: a hardboiled mystery that's closely intertwined with a short story about Westland in the condemned cell. I agree with that observation, because, despite the interlacing characters, they read as two completely different stories. Westland shares his looming fate and final dwelling place with two other prisoners: Dave Connor, a labor racketeer, who bumped off "a couple of New York torpedoes hired to fog" him, but the place where he unloaded his gun turned out to be swarming with cops – which, retrospectively, was not the best place "for fogging those Canzoneri brothers." The prisoner is a whimpering, crying and borderline psychopath, named Isadore Varecha, who gutted a prostitute and now spends most of his time on his cot muttering "Jesus Christ" and "I don’ wanta die." They have to deal with an unpleasant prison guard, Percival Galt, who enjoys taunting the prisoners, such as spilling a meal on the cement floor and saying he "can't help it if a prisoner throws his food into the hall," which reminded me of Percy Wetmore from The Green Mile (1999). Initially, Westland acquiesced in the hopelessness of his situation and was prepared to die on the electric chair, but a semi-anonymous letter gave him a change in attitude. The letter, initialed "MG," is from someone who had no business being in the building at the time of the murder, but if something can be fixed, so he doesn't "have no trouble," he’s willing to the D.A. what he knows. There is, however, a minor problem: all of this happened a week before Westland is strapped to the hot-seat! So Westland engages a high-price attorney, Charley Finklestein, but the evidence is stacked against him. Westland lived separate from his wife, Joan, but still retained a key to her apartment, which becomes a huge problem when her body is found there – shot through the back of the head. The only door giving entrance to the apartment had to be broken down and was outfitted with "a special lock" of "the kind that doesn't snap," but "has to be turned with the key." There were only two keys that fitted the lock: one of them was found inside the apartment and the other was in constant possession of Westland. All of the windows were locked from the inside and twenty-three floors from the ground. The small package entry in the kitchen was not big enough to have even allowed a trained monkey passage. What was really damning is that the neighbors heard the report of a gunshot at the time Westland admitted he was in the apartment. It's this package of evidence that send Westland en-route to the death-house. So Finklestein decided to fly-in a pair of private-investigators from New York, Bill Crane and Doc Williams, to reevaluate the evidence against the condemned man – before his time is up and they do so in typical hardboiled fashion. They got shot at from a car with a sub-machine gun, which leads to them roughing-up a suspect. There are several additional murders. They royally water themselves with drinks, take big meals and occasionally leer at women. However, there's also some genuine detective work on the part of Crane, which confirmed the traditionalist streak his plots reportedly contained. Crane provides a cleverly old-fashioned, but false, explanation for the problem of the locked apartment with a ball of string and a pin. This false explanation echoed the trick from L. Frank Baum's "The Suicide of Kiaros," which is an inverted locked room tale from 1896 and collected nearly a century later in Death Locked In: An Anthology of Locked Room Stories (1987). Unfortunately, the solution to the impossible crime aspect was disappointingly simple and routine. A type of "trick," or "misdirection," I have seen too often and I can honestly (and arrogantly) say I preferred my own explanation. But what can you do? Crane also finds the proverbial needle in a haystack with the assistance of a long, expensive cab-ride and even more expensive professional diver. It's an investigative operation that has put "more men to work than Roosevelt's recovery program." All of this tallies up to an interesting, often fun and occasionally even stirring, but ultimately uneven, debut novel. The gap in quality between the excellent death-house scenes and the investigative parts of the novel are hard to miss, which makes the somewhat disappointing conclusion to the case extra noticeable. Overall, Headed for a Hearse is not a bad book. It's just not a masterpiece of its kind. Nevertheless, I'm glad I finally got to sample Latimer, but I wish I had started with Murder in the Madhouse (1935) or The Dead Don't Care (1938). They seem like interesting combinations of the hardboiled narrative with a classic locked room problem at their core. So I guess those are for a later date. "But suppose, as in the old story about the man who played cards on an ocean liner with the devil, her adversary should choose to lead out the green ace of Hippogriffs?" The terms "Golden Age Detectives" and "Classic Mysteries" are inextricably linked to the British Isles, but, over the years, I have cultivated a strong affinity for their American contemporaries – which includes such luminaries as Ellery Queen, Kelley Roos, Clyde B. Clason, Helen McCloy, Craig Rice and Rex Stout. One of my personal favorites from this place and period in time is the funny and clever Stuart Palmer. Stuart Palmer was a screenwriter and novelist who wrote a host of mysteries. A lion's share of them featured that "meddlesome old battleaxe," Miss Hildegarde Withers, who made her first appearance in The Penguin Pool Murder (1931) – followed by thirteen additional novels and a handful of short collections. Some of my favorites from in this series are The Puzzle of the Pepper Tree (1934), Nipped in the Bud (1952) and Hildegarde Withers: Uncollected Riddles (2002), but, inexplicably, I had not returned to this series for many years. A situation that could no longer stand! So I picked up a copy of The Green Ace (1950). It's one of the last books in the series, only four more would follow over a period of twenty years, and has a plot modeled around a race-against-the-clock type gimmick. On an early, barmy Saturday morning, two police officers witness how a speeding car ignores a stop-signal and smashes into a parked delivery truck. Routinely, a ticket, an accident report and a stern warning would've been enough to delegate this incident to the dustbin of history, but one of the officers notices that "there was something crammed against the back seat" covered with "an old army blanket" – which obscured the naked body of dead woman. The driver of the car, Andrew "Andy" Rowan, is "a former hack newspaperman turned press-agent" and the "big glamazon" of a body, Midge Harrington, was his client and an aspiring Miss America. Rowan is held responsible for her murder and was unable to convince the authorities of his innocence. As a consequence, he’s tried, convicted and scheduled for execution within a year of his arrest. However, this was only the prelude of the story. A story that begins when Rowan is in the death-house and the clock begins to tick away the final days of his life. Somehow, the condemned man "managed to hang onto $3500" and drafted a will, in which he left the three-and-a-half grand to Inspector Oscar Piper. There is, of course, a catch: Piper has to use the money "to make a full and impartial investigation of the murder for which he is being unjustly executed." Inspector Piper is wary that the press will get wind of this "screwball will," but his old friend, Miss Hildegarde Withers, reminds him there's time left before Rowan "walks that long last mile through the little green door to the hot-sit" and does what she does best – sticking her nose where it has no business of being. Quickly, it becomes apparent what sets the ex-school teacher apart from other amateur detectives: Hildegarde Withers is not content with merely woolgathering or observing from an armchair. Withers prefers to actively pursue the truth, which has varying degrees of success and her actions often drive the plot itself forward. Her actions also tend to lend a comedic touch to the stories. For example, The Green Ace has her unsuccessfully impersonating the condemned man's wife and is arrested for shoplifting, but her shenanigans during an attempted identifications of a suspect with an "extremely prominent nose" put a strain on the friendship between her and Piper. So it's not all fun and games. 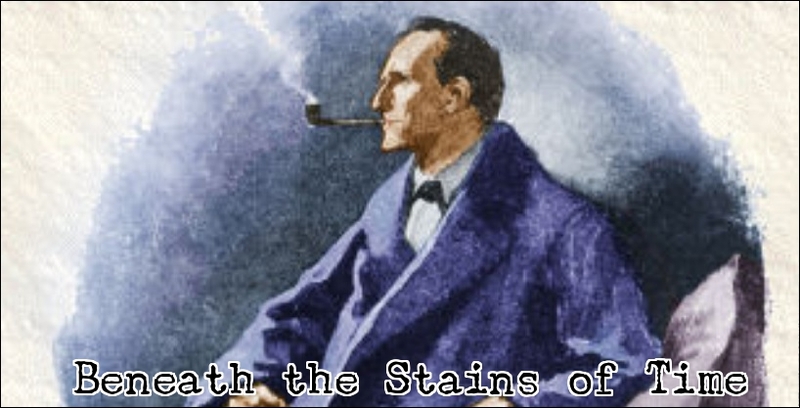 However, besides stumbling from one situation into another, making "a shot in the dark" and "play hunches," Withers is an ardent Sherlockian. She learned from the greatest of all detectives and applied his methods, of which the most successful one is a network of grownup-counterparts of the Bakerstreet Irregulars. As an ex-school teacher, "generations of grubby urchins had passed through her tutelage" and "had risen to positions of importance and influence," which she could call up on "just as Sherlock Holmes did on his Irregulars." Well, it's this combination of delightfully busy leg-work and recognizable Sherlockian wisdome ("the curious incident of the lipstick in the nighttime") that leads Withers to the logical explanation of a case that involves a deadly necklace, mysterious phone calls, hysterical laughter and a murdered medium – who was brained with her crystal ball. The most impressive aspect of the plot was how the reader's attention was diverted away from the obvious suspect and how a clichéd-ending was avoided. A gross miscarriage of justice was avoided, but not in the way you'd probably expect. So Palmer managed to do something original this plot-device and therefore warrants a read, but, if you're new to the series, I would recommend getting acquainted with characters first in their previous outings. On a final note, I have to point out how of a 1950s novel The Green Ace is, which includes a number of references to the dawning "days of television." Notably, there's a description of the apprehension of a suspect, as "newsreel cameras whirred” and "a man with a portable microphone ran forward," but "say something for the television audience" was met with a response that turned Channel Four "dark all over the nation" – not soon enough "to prevent the kiddies from learning some new words." There are also references to the H-Bomb, flying saucers and "under-the-counter Billie Holiday numbers." I found it interesting how these (now historical) references hinted at the changes in pop-culture and it's only natural that Palmer, as a writer for Hollywood, was aware of them and they found their way into his work. Well, that was it for this review and now comes the excruciating process of deciding what to devour next. A locked room mystery? The Three Investigators? Something hardboiled? A historical detective? Maybe finally wrote that blog-post about what makes a good impossible crime? Choices, choices, choices!